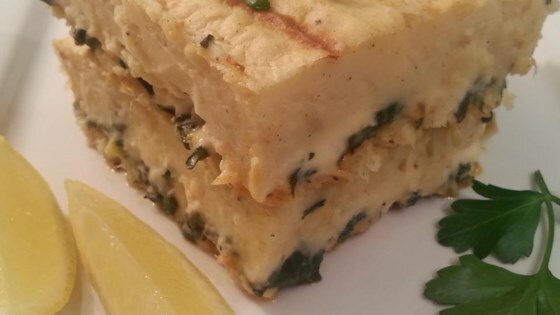 "My Fisherman's Pie gives you flaky cod mingled with spinach in a garlic and lemon-scented sauce underneath a browned crust of creamy, buttery potatoes on top. It really does taste fantastic." Bring a large saucepan of salted water and to a boil; add russet potatoes to boiling water and cook until very tender, about 20 minutes. Drain well. Mash in 3 tablespoons butter until thoroughly combined. Season with nutmeg, salt, black pepper, and cayenne pepper to taste. Mash 1/2 cup milk into potato mixture until smooth. Drizzle olive oil in a large Dutch oven over medium-high heat, add spinach, and season with a big pinch of salt. Cook, stirring occasionally, until spinach has wilted, about 1 minute. Transfer to a bowl lined with paper towels to wick away excess moisture. Heat 3 tablespoons butter and flour in a saucepan over medium heat; whisk mixture to a smooth paste. Cook, stirring constantly, until mixture has a nutty smell and is slightly browned, about 2 minutes. Add chopped garlic; whisk until fragrant, 10 to 20 seconds. Whisk 1 cup cold milk into flour mixture; cook until thickened. Whisk in remaining 1 cup milk and lemon zest. Bring white sauce to a gentle simmer, whisking constantly; season with salt. Turn heat to very low and keep sauce warm. Preheat oven to 375 degrees F (190 degrees C). Grease an 8x12-inch casserole dish with 1 tablespoon butter. Season buttered pan with salt, black pepper, and cayenne pepper. Lay boneless cod fillets into the pan in a single layer. Season tops of fillets with more salt, black pepper, and cayenne pepper. Spread spinach evenly over fish and drizzle with lemon juice. Spoon white sauce over spinach; give casserole dish several taps and shakes to eliminate bubbles. Drop mashed potatoes by heaping spoonfuls over the casserole and spread smoothly to cover. Place dish onto a rimmed baking sheet to catch spills. Bake in the preheated oven until bubbling, about 40 minutes. Turn on oven's broiler and broil until potato crust has a golden brown top, about 2 minutes. Fish should flake easily. Let stand 10 minutes before serving. Garnish with a sprinkle of chives. Wow! 6 Stars! This was the Ultimate in Comfort Food! Simple, Easy, Delicious. I really can`t rave enough...I`ll be making this again and again and again. Thank You So Much Chef John!!! Made this for supper last night. Super easy and delicious. Used frozen chopped spinach and it worked out fine. DH said "You can make this again."